Basics: The modelbinding in ASP.NET is “relatively” clever and you are able to bond almost everything. All you have to do is to understand how the binding works and you often found that out if you take a look via Fiddler and co. at what is transmitted as HTTP. The model is very simple but it contains objects from the same type as a list. I present you three different models of how to integrate complex objects into this method. With the “[NUMBER]” of the field the MVC Binder will know that this is only a list. It’s possible to get this as interlaced as you like. It’s important at that point that the numbering is continuous. Next we create a “requestData” and set our “Name”-Testproperty and connect the Array. To transmit this to our controller we need to transform the files. The easiest way for this is the JSON-format. Newer browsers have a JSON support but to be sure I recommend you to use the JSON Helper from Douglas Crockford “json2.js” (it’s also available on NuGet). With this script you will receive the method “JSON.stringify()” (the link leeds to the Mozialle Developer Center – the same thing is in the MSDN) which transforms an object into JSON. 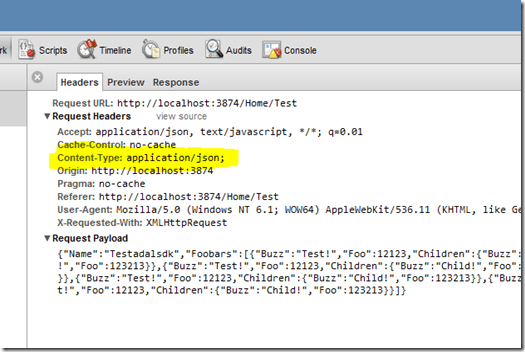 Because of the content-type: application/json the MVC framework uses the JSON modelbinder automatically and the information’s will be transmitted to the controller. 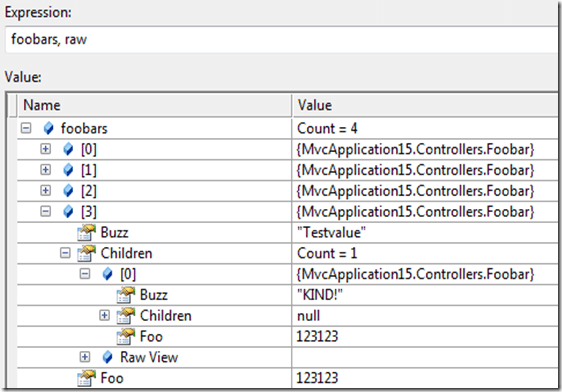 You are able to do almost everything with the MVC Modelbinding if you keep in mind some basic rules. 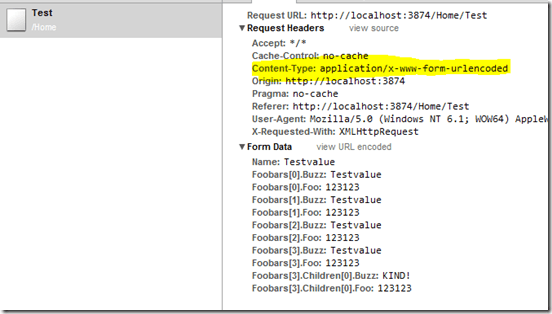 Also a look onto what is transmitted via HTTP will help you a lot with the Debugging. The whole demo application is available here – but there is also code included from another Blogpost.